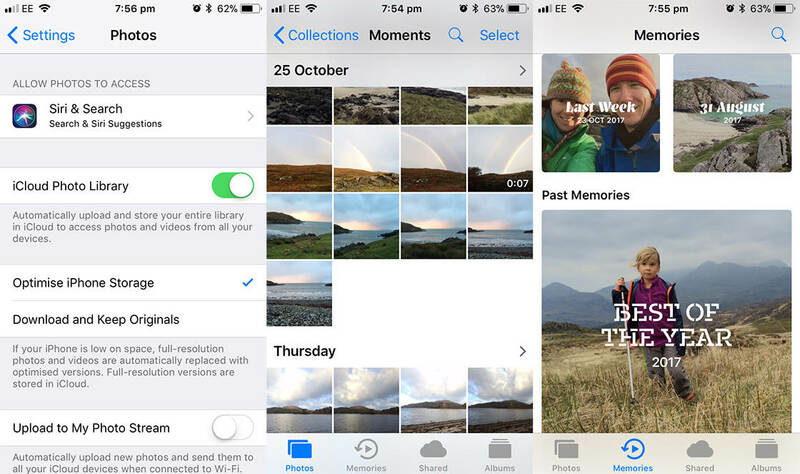 There are many apps offering a service to give us snap-happy iPhone photographers some much needed extra storage space. But which one should you go with to store or backup your photos? 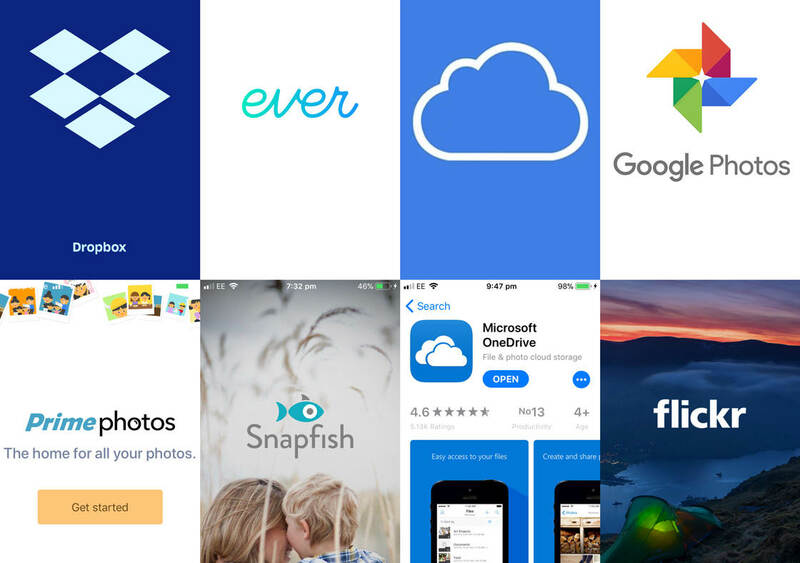 In this article, you’ll discover eight of the best storage apps to help you make an informed choice about which is the best photo storage app for your needs. Backup photos and access them easily across your Apple devices. No need to visit the app store for this one. It’s already there in your iPhone. iCloud Photo Library is part of Apple’s all-in-one iPhone backup and device syncing facility. 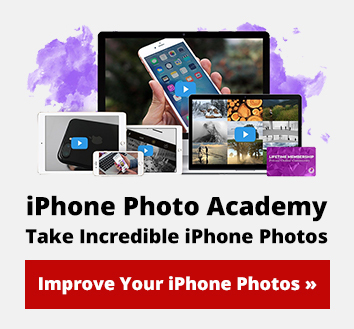 Essentially it allows you to backup photos and videos stored on an iPhone, iPad and iMac to a shared iCloud space so that you can then access them across devices. Therefore it’s perfect for people who regularly use the same Apple ID on more than one Apple device.  When a change is made on one device, for example a photo is deleted, this will be reflected in what the iCloud holds. 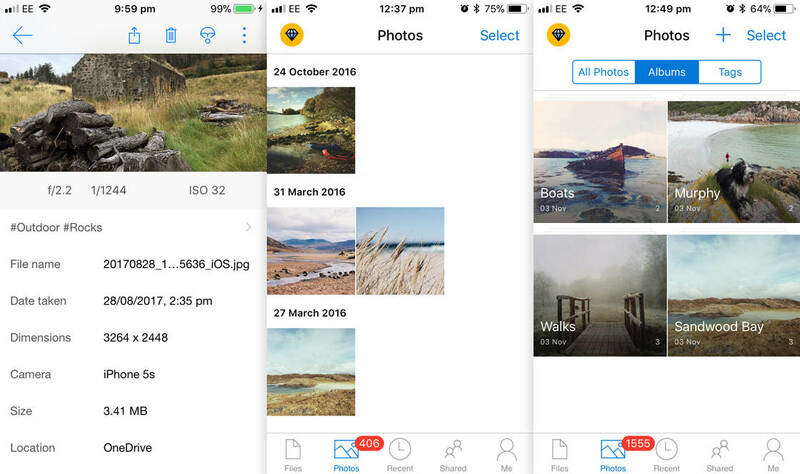 If you are looking for a storage app that allows you to upload your photos to it and delete the same photos from your iPhone in the knowledge that the photo will still be held in the cloud then you should look at downloading one of the other apps we’re discussing here. However, there is a way to free up some space on your iPhone and make use of iCloud Photo Library as an extra storage option. To do this you will need to select ‘Optimise iPhone Storage’ when activating your iCloud Photo Library via Settings –>Photos. With this option activated iCloud Photo Library will automatically store the full resolution versions of your photos in the iCloud and replace with a space-saving version on your iPhone. The originals are always available for download when you need them. 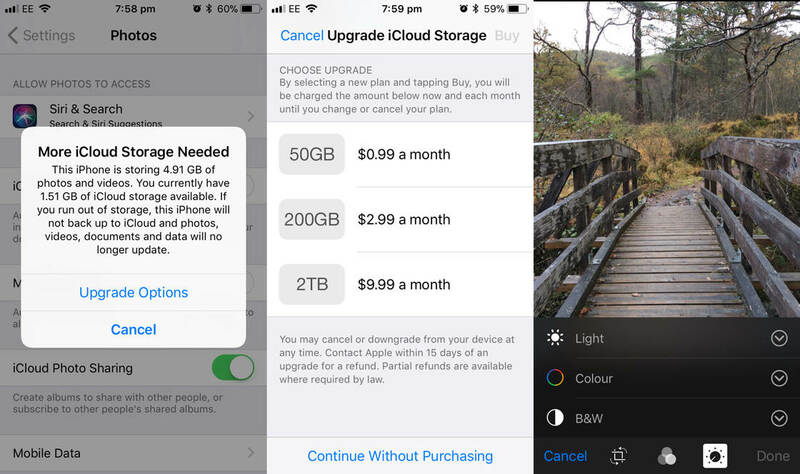 You’ll only get 5GB for free though so will more than likely need to pay a monthly charge to upgrade to more space if you want to use iCloud Photo Library to its full potential. If you don’t pay and go over your allocated free space uploading of photos will cease. Additional space is cheap with 50GB costing just $0.99 per month. Other plans available are for 200GB or 2TB and it’s worth noting that if you go for one of these two larger plans you will be able to share this space with family members. You can make use of the iCloud Photo Sharing option to create albums to share with other people and to subscribe to other people’s shared albums. The creation of ‘memories’ videos are a nostalgic nice touch.  Enjoy reliving your day or even year by viewing one of these automatically generated photo compilations. And you can use the familiar editing tools offered in Photos on any photo from your iCloud. Huge amount of free storage and a social network in itself. Storage space is not unlimited, but you will get a massive 1TB or 1000GB of space for free. 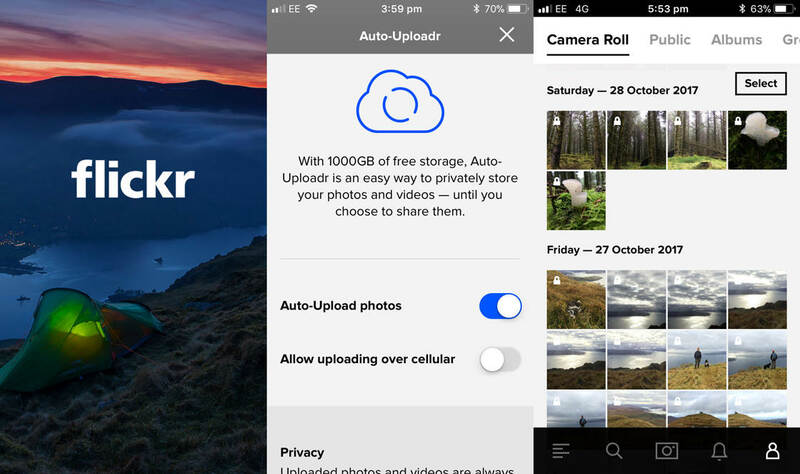 Use the ‘Auto-Uploadr’ to ensure all your images and videos are backed-up on the app. To set up the Auto-Uploadr you’ll need to go in via the settings cog icon and then activate the tool – choose to just do this when connected to Wi-Fi to save on monthly data allowances. Flickr also includes some nice editing tools within the app and a set of preset filters. You’ll also be able to look at the camera information for each photo uploaded to Flickr so you can see the behind the scenes info if you want to. 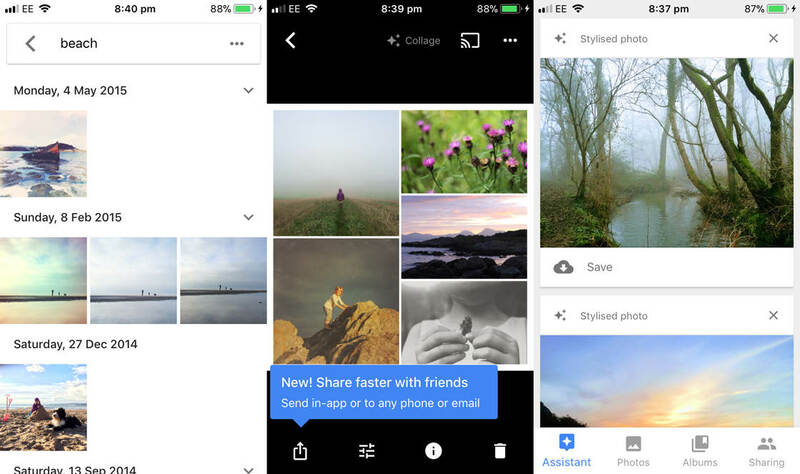 In using the app you’ll not only get to browse through your own stored images but will get to see a feed recommending other users that you may want to view shared photos from. The feed operates in an Instagram-like way allowing you to like and comment on images. Your images will stay private though unless you choose to share them. Flickr used to make you create a Yahoo email account to allow you to register but for those of us who don’t want another email address this requirement no longer exists and you can now register with any email address. Unlimited free storage and print options. 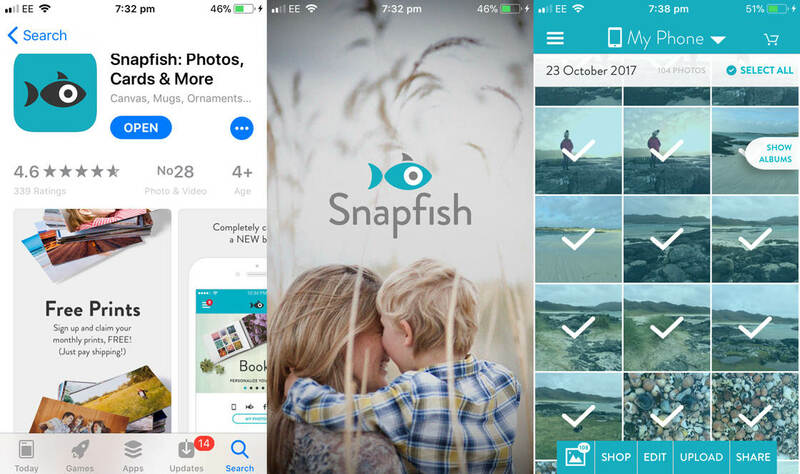 For a more selective approach to photo storage, the Snapfish app offers some attractive features. You’ll get unlimited free storage at full image resolution but will need to manually select those images that you want to store. This can be done in large batches making it an easy task. You can easily link to your iPhone camera roll, Facebook, Instagram and Google Photos directly from the app to upload photos. The storage is a sideline to the app’s main business of printing images. Whether as individual prints or compiled into a photobook or in one of the gift forms such as mugs, key rings etc. Once you have your images stored in Snapfish you can then use them in multiple projects. So, there’s no cost for photo storage but if you want to print you’ll need to pay. That said, you are given 50 free prints per month when you sign up. The app provides handy tools for fine-tuning your photos such as red-eye reduction and basic editing tools ensuring that any chosen prints are optimised. Unlike some other similar services, Snapfish is not based in a single country and instead has bases in Europe, North America and Asia Pacific. Handy for keeping the delivery charges down. A great all-round iPhone photo storage option. 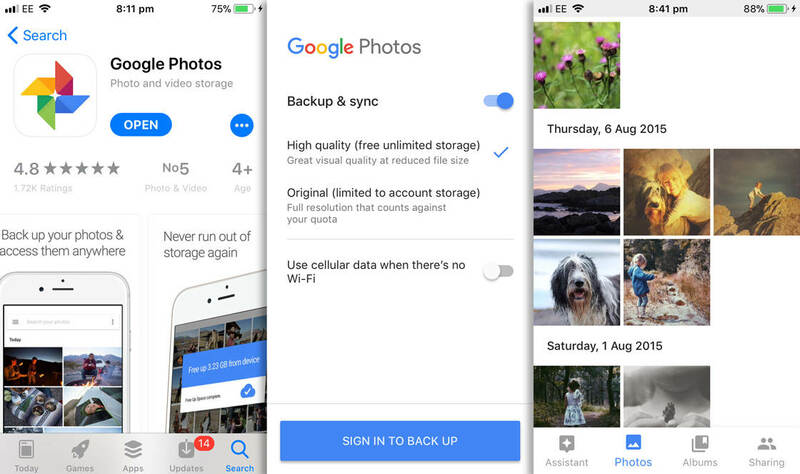 If you’re looking for unlimited free storage space to backup photos then Google Photos could be for you.  However, you are restricted on the maximum resolution of individual images and videos that can be stored. 16 megapixels is the maximum for images but this should be sufficient for most mobile photography. For videos you’ll only be able to store at up to 1080p resolution and up to 15 minutes long. If you ever need to go bigger than this, you can store at original quality but this will use your Google Drive storage – 15GB for free and then payment options for more. Useful if you want to add in images from other sources at original size to keep everything in a single archive. It is all very well to be able to upload unlimited images, but unlimited images can soon amount to thousands of images. For the archive to be useable you’ll need to have a way of finding an image. Google Photos has just the feature for this. Visual features and subjects can be searched for within the categories of people, places and things. No tagging required. So, to find that birthday photo from two years ago, search “cake”! Have fun creating your own collages, animations and movies by making selections of your favorite images. Or allow Google Photos to surprise you with some that it creates for you. You’ll get a notification in the app when one has been prepared. Easily share these with friends and family and with the apps compatibility with Google Chromecast you can also enjoy viewing albums on your television. 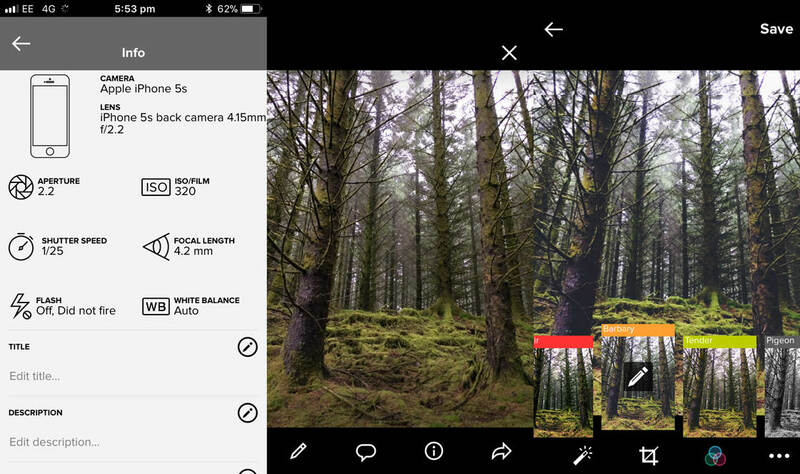 The app offers some powerful editing tools so you can transform your images. The app will also edit images for you with stylized photos where images are edited by the app. 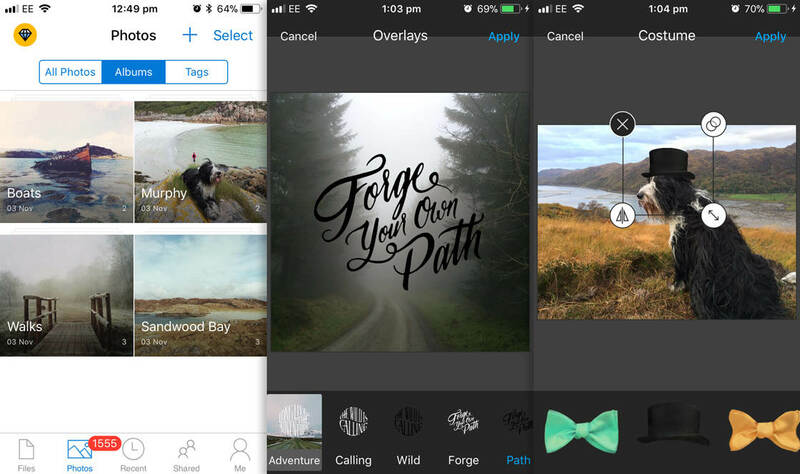 Panoramas, where the app will cleverly stitch together images for you, are also automatically created. A great choice for Amazon Prime customers. All Amazon customers get 5GB of free storage but this increases to unlimited photo storage space if you have an Amazon Prime account. So you should certainly look to make use of the unlimited free storage available to you via the app if you are a premium Amazon user. The ‘Family Vault’ feature in Amazon Photos allows up to five additional people to contribute photos to your unlimited storage account. A very useful feature to combine photos in a single place within the family. Photos are backed up automatically by this app. 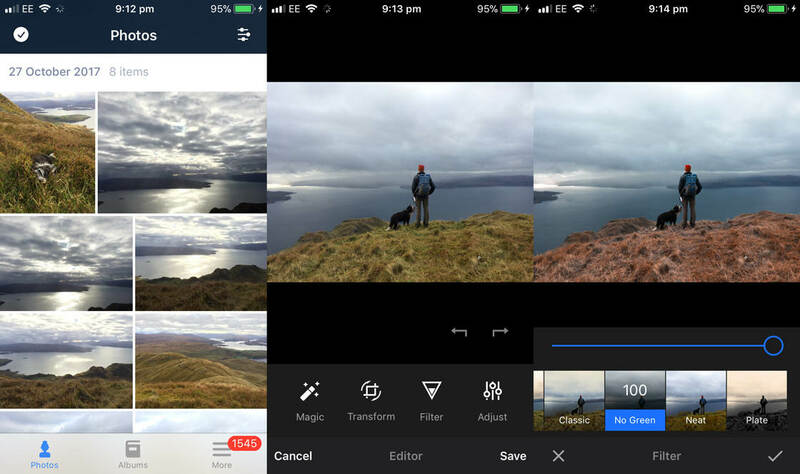 You’ll also be able to tweak your photos with the in-app editing tools allowing you to adjust brightness, color, focus and more as well as applying preset filters. But do be aware that if you cancel your Amazon Prime membership you’ll lose your unlimited storage benefit. Upon cancellation, if you exceed the 5GB that is free to all, you’ll get the option to switch to a paid storage plan for your photos. A classic storage app for all types of files.  Dropbox is a popular cloud storage provider and is used by individuals and businesses alike.  Paid plans are also offered with the maximum 1TB available on a personal plan. It’s useful to note that if you downgrade a payment plan your files will still be available to you. You just won’t be able to add to them. 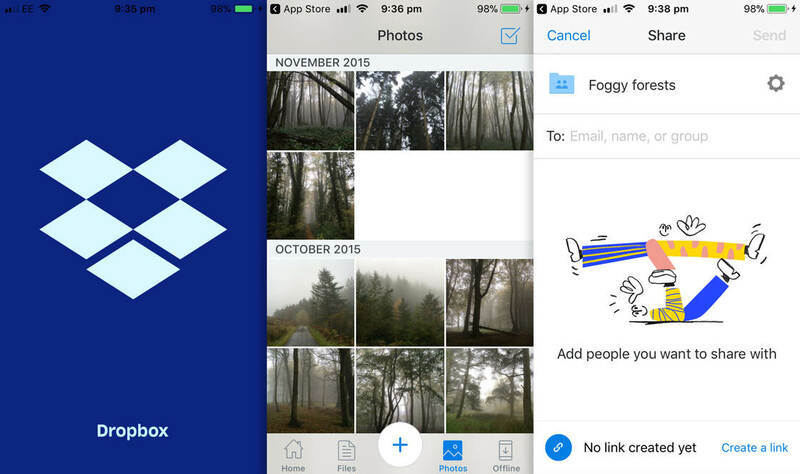 Sharing between Dropbox users is easy. But it’s also easy to share folders by sending a link to people who don’t have a Dropbox account. They’ll have the opportunity to create their own Dropbox account or to simply view the contents of the link online without the need to have their own account. A good choice if you’re an Office 365 user. Although a Microsoft product, the app is also available for use with iPhones, iPads and iMacs. 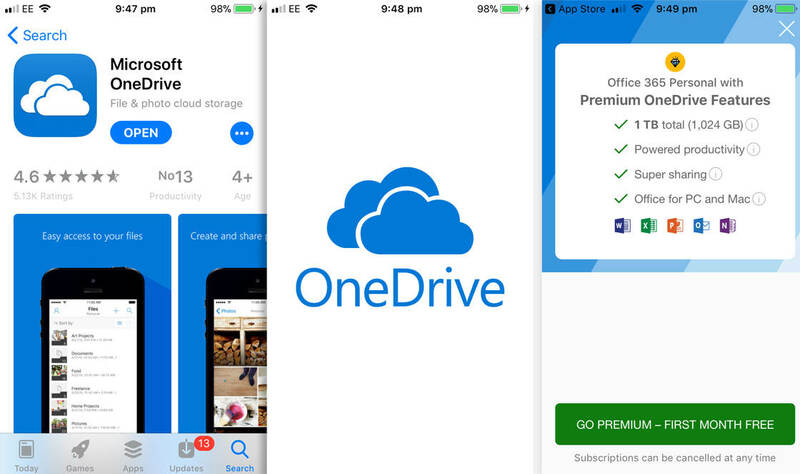 OneDrive is mostly going to appeal to you if you use Office 365 enabling seamless integration between your iPhone photos and devices. With OneDrive Basic you’ll get 5GB of storage space for free. You can upgrade to more space with one of the payment plans on option. More features become available to you as you pay more. The space is available for the storage of photos, videos, documents and more. Automatic uploading is available. You’ll be able to look at the camera setting information for each photo, organize photos into albums, rename and share them. However, beyond that, there’s no function to edit photos in OneDrive. High security and fun to use. 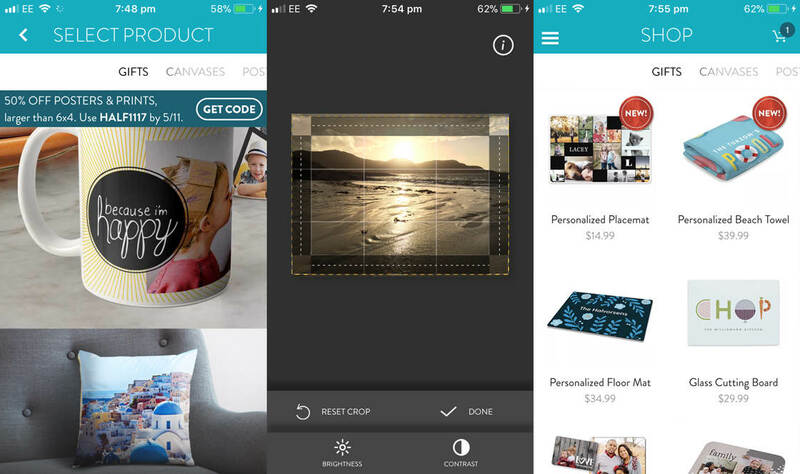 Ever is a security conscious iPhone photo storage app which backs up your photos. 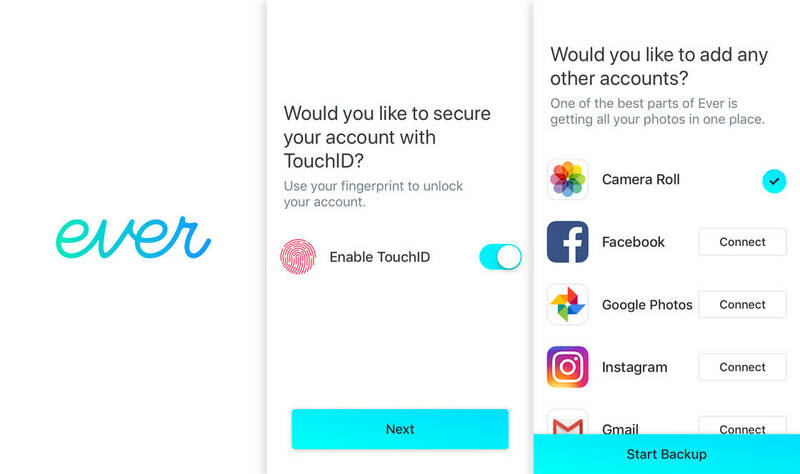 The setup process includes the option to use Touch ID and makes it very easy to connect to social media accounts such as Instagram and Facebook.  It even connects easily to other storage accounts such as Google Photos. Back up takes place when connected to Wi-Fi by default to save using up monthly data allowances. All photos stored in Ever remain private until you wish to share them.  The free app will always backup photos at high resolution. If you want to store your photos at the original full resolution there is a monthly charge of $11.99. With the paid version, Ever Plus, you’ll also be able to store videos. The app has some fun editing options included. Get creative and download some of the many free add-on packs giving you stickers, overlays, and more to add to your images. The apps mentioned above are all easy to set up. Consider each app’s features and then try a few out to see which one you like the most. Each has its own appeal. 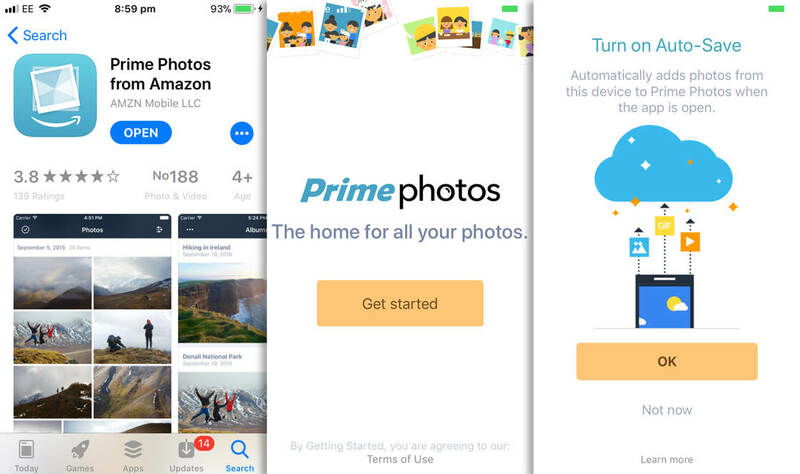 Remember the extra iPhone photo storage you are gaining by using an app cloud service also serves as a valuable backup of your precious photos. Do consider future proofing. 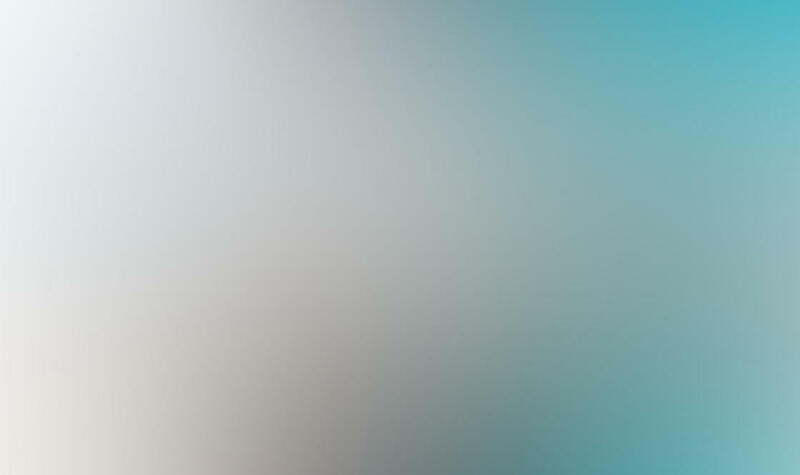 It is so easy to set an app to automatically backup photos. Why not use more than one so that if the worst comes to the worst, and a service stops, you won’t lose anything. Now, the apps we covered in this article are great. And the things you can do with apps these days are incredible! But we have to warn you about something. The apps you use are just tools. They can be used to create both poor and amazing photos. The quality of your photos depends on your photography skills, not apps!